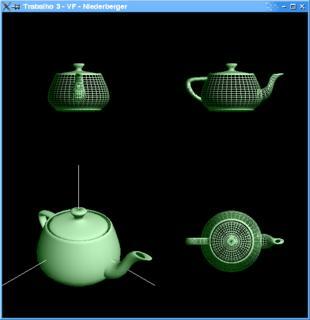 Sample of OpenGL usage. Displays a mesh in four views, featuring scaling, rotation and translation. Implemented in C.
Hi! This is Mani from singapore, actually i am a student of digital media technology, i am trying to display a model in .m format to opengl and doing translation and rotation. But i am unable to load the image from the M file. The file carries the models in vertices, normal and faces. I found your source code will be more helpful for me to understand the concept . could you please send me the link to download your mesh viewer or send me the code to acchuthan@yahoo.com.sg. Few examples have been jointly approved for the practical display of the tings for the humans. All the schemes have been ensured with help with my thesis for the approval of the better and elevated things for the humans in life.